JCC Chai Sports is part of the JCC’s of Greater Toronto. 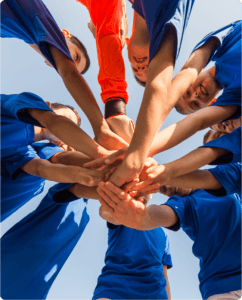 We feature leagues and programs that make sports a positive experience for your child. Our philosophy is to provide children with the opportunity to develop sports skills in a fun and recreational atmosphere. Your young athlete will learn the fundamentals of their sport in a program designed for maximum participation and individual skill development. Through instilling these skills and fundamentals, we strive to cultivate players with a strong sense of self, whose desire for excellence, compassion for others, and aspirations for self-betterment will make them valuable leaders and contributors both on the field and in the community. These children are our greatest assets and our top priority.